These binoculars have been superseded. The Leica Trinovids are venerable phase-corrected binoculars with an optical quality that verges on the celestial. For brightness and edge-to-edge crispness, nothing beats a Leica. Nitrogen purged and nitrogen filled, Leicas won't fog up internally, and they're waterproof to a depth of 15.5 feet. Made from die-cast aluminum, these are sturdy binoculars. While the polyurethane coating is hard to the touch, it does provide shock-absorbing characteristics to the binoculars. At 31.5 ounces each, the 8X42 and 10X42 offended a couple of necks, but it is not unusual for binoculars of superior optical quality to weigh more than lesser instruments. One petite woman judge remarked that the 12X50s (40.6 ounces) were wonderful binoculars and would be perfect for a giant. However, the Leica 10X32 Trinovids weigh a mere 22 ounces. The diameter of its objective lens is 32 mm. Because the exit pupil is only 3.2 mm. for some users they will dim earlier at dusk than comparable models with a wider objective lens. However, they provide a brilliant picture in daylight. 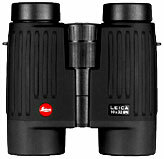 The 8x32 Leica Trinovid Ultra is considered one of the best mid-sized binoculars at any price. The diameter of its objective lens is only 32 mm., like the 10x32 Leica Trinovid, but the 8x32 is brighter, because its exit pupil is a significantly more generous 4 mm. These small 8x32 Leica binoculars have another feature that sets them apart from the rest of its genus: it close-focuses at 8.5 feet instead of the 15 to 17.5 feet of the larger Trinovids. Leica's push-pull eyecups are a welcome improvement over the old-style rubber eyecups still found on many binoculars. If you want a really teeny-tiny outstanding binocular, check out the Leica pocket 8x20 Trinovid. Caution: Gray market Leica products do not qualify for warranty or service from Leica USA. Gray market Leicas can be sent back to Germany, a process with which Leica will help the customer, for a charge. However, the warranty in Germany is for only 30 years, not lifetime. To avoid inadvertently buying gray market Leica products, make sure there's a USA warranty card in the box.